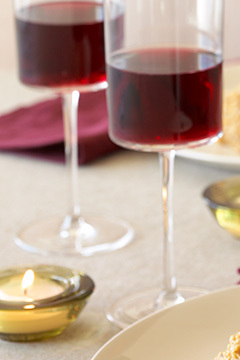 This makes a cozy dinner party for the first golden days and crisp Napa Valley nights of fall. The compote is made while the pork is roasting, so everything is ready at about the same time. 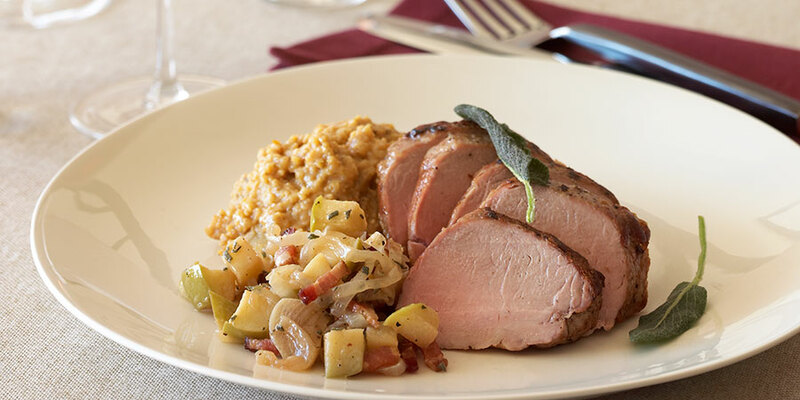 Soft, creamy polenta is a perfect bed upon which to nest the pork tenderloin slices. Leftovers make inviting sandwiches. Preheat the oven to 400°F. Mince 8 of the sage leaves. Bring the tenderloins to room temperature and dry completely with paper towels. Place a roasting rack on a baking sheet. Season the pork with 1 teaspoon of the salt and 1/4 teaspoon pepper. In a large sauté pan or skillet over medium-high heat, heat 2 tablespoons of oil until a sheen develops and oil begins to separate. Add the pork and brown well and evenly on all sides, turning occasionally, about 2 minutes per side. Remove the pork from pan (reserve pan) and place pork on roasting rack. Place the pork on the middle rack in the oven. Add bacon to reserved pan and cook over medium heat, stirring frequently, until crisp, about 4 minutes. Stir in the garlic and cook for 30 seconds or until aromatic. Stir in the onion, sage, and thyme and sauté, stirring and scraping the bottom of pan for browned bits, until onions are tender, about 4 minutes. Add the apples and sauté until the apples are lightly caramelized and tender, stirring, about 5 minutes. Turn the heat to high and add the cider to deglaze the pan. Scrape any remaining browned bits from bottom of pan. Lower heat to medium-high and reduce the liquid to a thick glaze, stirring occasionally, 4 to 5 minutes. Season with remaining 1/2 teaspoon of salt and 1/4 teaspoon of pepper. Remove from the heat and keep warm. Roast pork until the center of the meat reaches an internal temperature of 145°F for medium rare (pink in the middle), about 25 minutes and 150°F for medium, about 30 to 35 minutes. Remove the pan from the oven and cover loosely with aluminum foil. Let stand for 10 minutes. The internal temperature will continue to rise by 5 to 10 degrees. While the pork is resting, heat the remaining oil in a small saucepan over medium-high heat. Once the oil is warm enough so that the sage leaves sizzle without smoking, fry the remaining 16 sage leaves until crisp, about 10-20 seconds. Remove the sage leaves and place on paper towels to drain. The suggested wine for this dish is Pinot Noir.